Proprietary blend of technological ingredients work to firm skin vertically and tighten horizontally. 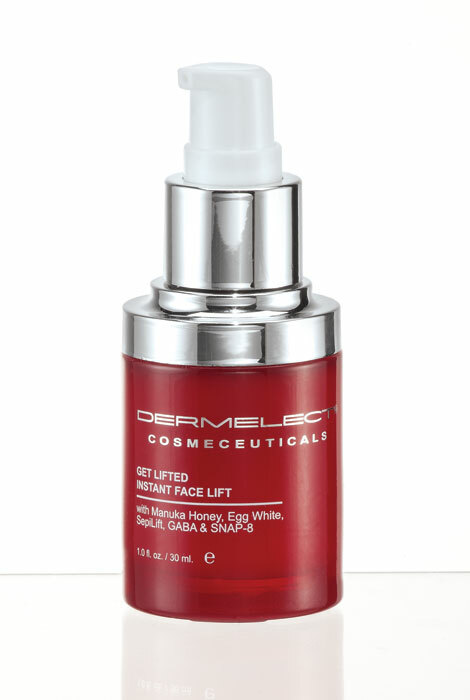 A little lift can make a big difference when sagging skin is concerned, and this high-tech Dermelect® get lifted instant face lift works without injections or costly procedures—firming and contouring face, jaw line, and décolleté, leaving skin feeling intensely hydrated. With the very first application, the proprietary Dermelect® blend of natural and technological ingredients work to firm skin vertically and tightens horizontally. Packing a hydrating punch of pure Manuka honey with natural firming properties of egg white, it lavishes skin with a unique anti-aging complex of SepiLift, SNAP-8 and GABA—firming instantly like a tightening masque. Skin feels velvety smooth yet sculpted, lifted, and taut. Apply to freshly cleansed skin, under foundation or moisturizer, if desired. Paraben free. 1.0 fl. oz. Aqua, Mel, Glyceryl Stearate, Cetyl Alcohol, Hydrogenated Polyisobutene, PEG 40 Stearate, Hydroxyethyl Cellulose, Gamma Aminobutyric Acid, Glycerin, Dipalmitoyl Hydroxyproline (SepiLift), Albumen (Egg White), Butylene Glycol, Carbomer, Polysorbate 20, Honey Extract (Manuka Honey), Palmitoyl Oligopeptide, Palmitoyl Tetrapeptide-7, Acetyl Octapeptide-3 (SNAP-8), Plankton Extract, Lecithin, Parfum (Fragrance), Phenoxyethanol, Ethylhexylglycerin. I was only able to use this product once and it literally made me ill from the heavy perfume smell. the smell wouldn't even wash off. This is not a product for anyone with allergies to perfume or chemicals. Wish I was able to see if it actually works. to see if it really works on wrinkles! Hope to eliminate wrinkles on my face. Nasofabial folds on face I hope it tightens & mouth to chin area also!! I have used other Dermelect products and have found them to be good quality. I just met with a plastic surgeon to ask about a face lift. The cost of eleven thousand dollars puts this procedure out of my reach. So I selected this to see if i could see some improvement without surgery. A friend told me about this product and highly recommended it. It works great! I'm trying to find something that works .. Hope it does! !